This topic contains 12 replies, has 2 voices, and was last updated by Nayem 4 years ago. Hi don't know how many i have submitted, i just like to know how the new shipping process work? It seem like the shipping cost won't calculate after i update. Here is the change log of Dokan plugin- http://docs.wedevs.com/dokan-plugin-changelog/. I hope you getting my reply, my website now, couldn't proceed to checkout because of the shipping. You did not select your shipping method. If you are having difficulty then please provide your login details by using this form: http://wedevs.com/provide-login-details/. I will have a look what is going wrong. Hi Nayem, credentials provided and i believe i had followed the instruction it will be great if you could take a look. I have checked your site. You did not select shipping method from backend. I have set everything. In seller dashboard you have to enable shipping with the details. Every seller have to set their shipping from their dashboard. 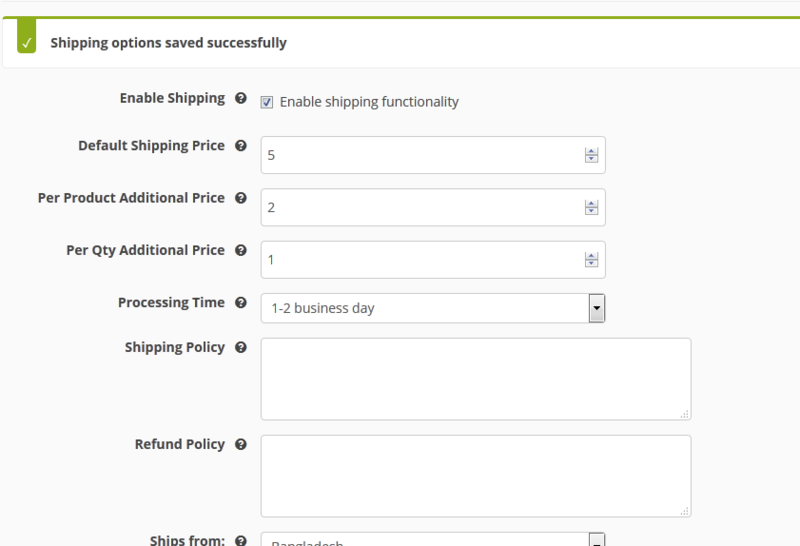 You have to also set your shipping method from WooCommerce->Settings->Shipping->Sipping Option. Please check now. It is working fine. I think i had checked and select the methods before this, but is good to see it's work now.For the announcement how exactly it work, are them just manage to see from the dashboard or they will received an email as well? 1st – Can we update the vendors shipping option or any chance for us to view it? When user checkout the shipping cost became RM 27 with this 2 state. Now, what i do, update both state to RM5 , Sarawak it's work fine, it show me RM16 when checkout, but Sabah not working at all, even i removed and add again still the same. 1. Only seller can update their shipping rate from their dashboard. 2. Can you please provide that seller account where you have set the shipping rate?. I think you are missing something. If you have selected two different rate for tow different stat then in the checkout page or cart page it should calulate with the selected rate. I have tested in my side and everything is fine here. Please clear your browser cache, Update the shipping method correctly. I got your mail and very glad to know that it works. You can set your state shipping rate as you want. Please post your reply directly here. – 2nd Item, RM 22 + 5 can, we make it +10? The topic ‘How's the new shipping work’ is closed to new replies.